First Guru Nanak Dev returned from his mission tours and lived in Kartarpur until the end of his days. The guru became widely renowned and respected for his humble service to humanity. 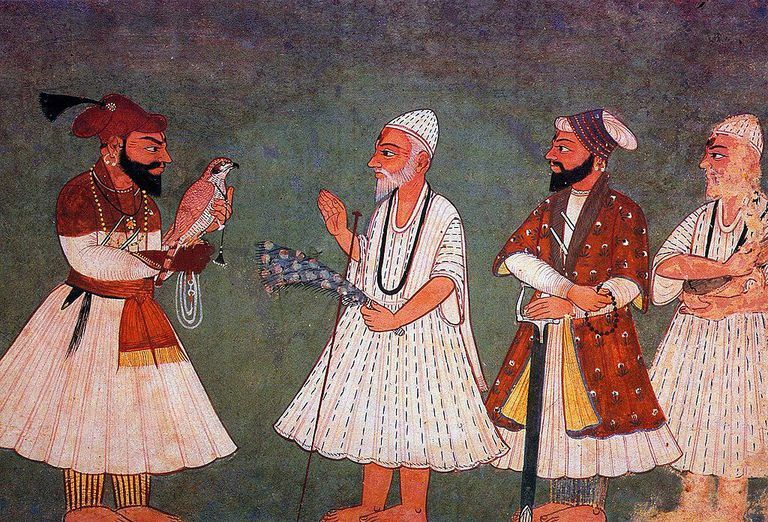 Newly founded Sikh, Hindu and Muslim devotees all claimed the guru as one of their own prophets. When it became apparent that Guru Nanak Dev Ji's end was imminent, an argument ensued as to who would claim the guru's body for funeral rites. The Muslims wished to bury him according to their customs, while the Sikhs and Hindus wished to cremate his body according to their beliefs. To settle the matter, Guru Nanak Dev himself was consulted as to how his remains should be disposed of, and by whom. He explained the concept of joti jot, that only his mortal body would expire, but that light which illumined him was divine light and would pass to his successor. The guru requested his devotees to bring flowers and instructed the Sikhs and Hindus to place flowers on his right side and the Muslims to place flowers to his left side. He told them that permission for funeral rites would be determined by whichever set of flowers remained fresh throughout the night. After he had departed his body whoever had brought flowers which did not wilt should have the honor of disposing of his mortal remains in the manner they deemed fit. Guru Nanak then requested that the prayers of Sohila and Japji Sahib be uttered. After the prayers had been recited, the guru requested that those present arrange a sheet over his head and body, and then he instructed everyone to leave him. With his last breath, Guru Nanak infused his spiritual light jot into his successor Second Guru Angad Dev. The Sikh, Hindu and Muslim devotees returned the following morning on September 22, 1539 A.D. They carefully lifted and removed the sheet which had been placed over the guru's body. All were amazed and astonished to discover that no trace at all remained of Guru Nanak Dev Ji's mortal body. Only fresh flowers remained, for not a single bud had wilted of any blossom which had been left by either Sikhs, Hindus, or Muslims, the night before. The Sikhs, Hindu and Muslim devotees responded by erecting two separate memorials in order to commemorate Guru Nanak Dev and revere him as their own. Two shrines, one built by Sikhs and Hindus and the other by the Muslims, were placed side by side on the banks of the River Ravi in Kartarpur, a part of Punjab located in modern day Pakistan. Over the centuries, both of the shrines have each washed away twice by flooding, and been rebuilt. Guru Nanak is considered by Sikhs to have departed his body only. His illumined spirit jot is believed to be immortally divine and to have been passed on through each of the succeeding Sikh gurus, to now and forever reside with Guru Granth Sahib, the holy scripture of Sikhism as the eternal guide to enlightenment. Where Can You See the Actual Hand Print of Guru Nanak?